Created by Stan Lee and Jack Kirby, Henty 'Hank' Pym has been associated with various characters in the Marvel universe. Originally, he was a scientist and inventor who developed a serum that could allow him to change the size of his body. Later, the character would be one of the founder members of the Avengers super-team. See live items below featuring key appearances! Click for values. Check values here | Have yours appraised FREE by us! 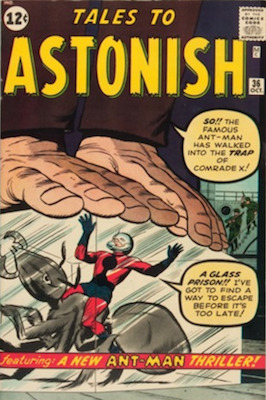 In his first appearance and origin comic in Tales to Astonish #27, Henry Pym develops a reduction serum that shrinks him to the size of an ant. 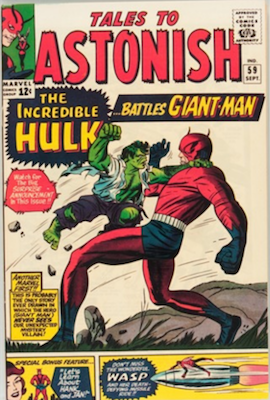 Written by Stan Lee and Larry Lieber, Jack Kirby designed the cover for Tales to Astonish #27. 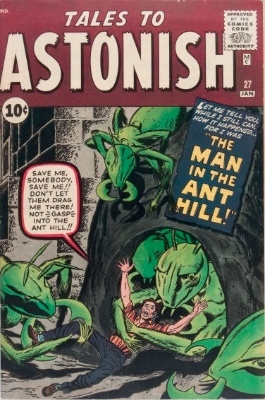 The original story was entitled The Man in the Ant Hill. 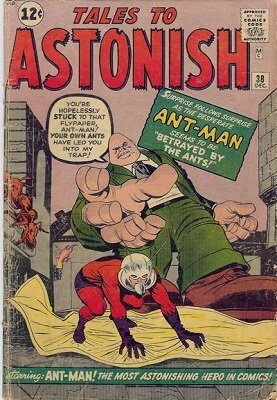 "Never again did Henry Pym knowingly step upon an ant hill. For he knew that somewhere beneath him… was one little insect — one small ant, to whom he owned his very life!" 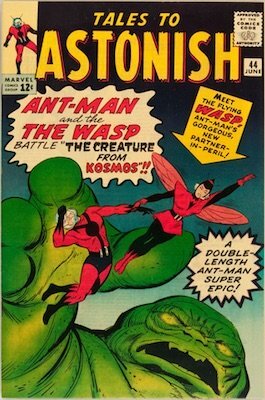 It wasn't until Tales to Astonish #35 when The Return of the Ant Man, when Henry Pym used his powers to fight Four Soviet Agents and Nikita Khrushchev. 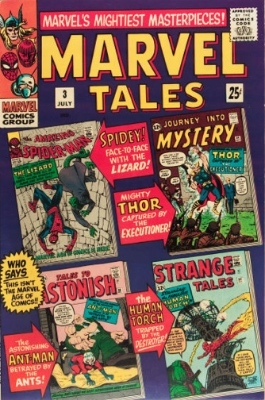 Published in September 1962, issue #35 was written by Stan Lee and drawn by Jack Kirby. Additional stories included The Doorway to Nowhere and The Thing from Outer Space. "Stop him, my pets!" screamed Ant-Man. "Obey your leader! 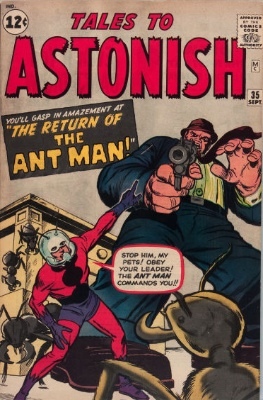 The Ant-Man commands you!" This was the first appearance of his legendary helmet as well. 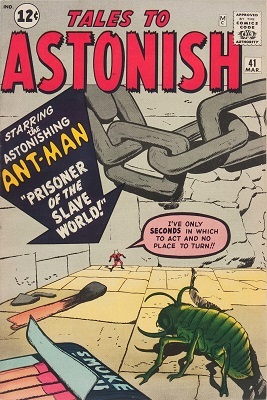 In Tales to Astonish #36, Pym battles Comrade X (first appearance), along with some bank robbers. Additional characters include the US Coast Guard, Police Officers of the 14th Precinct and mention of Nikita Khrushchev in a photograph. 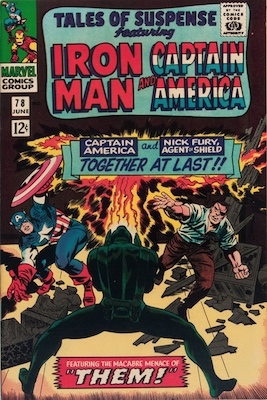 The Challenge of Comrade X was written by Larry Lieber and drawn by Jack Kirby, while Stan Lee hung back as editor. 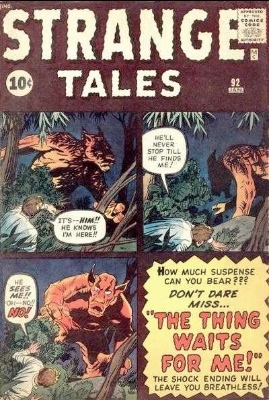 An additional story in this issue was entitled The Search for Pan. 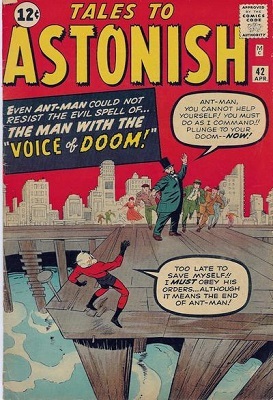 The mighty Ant-sized hero became a regular on the cover of Tales to Astonish. Click any of the links or images below to check current values. Here are many more appearances where the Henry Pym stars, or at least crosses over as the pint-sized superhero. While it's not a dedicated Ant-Man comic book, Avengers #1 is definitely a key appearance of the pint-sized superhero. 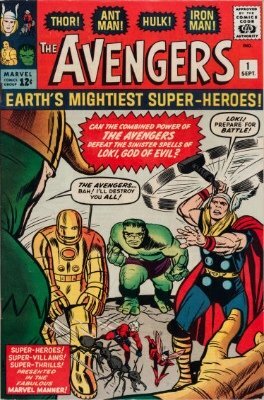 Rather than duplicate effort, you can read our Avengers Comic Book Price Guide to find out what the issues featuring the insectoid star are worth today! 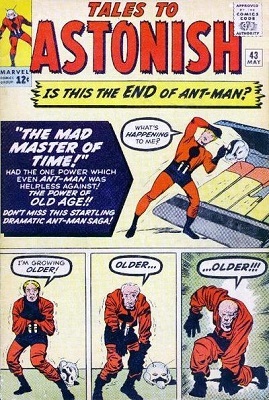 Fantastic Four #16 is his earliest crossover issue. 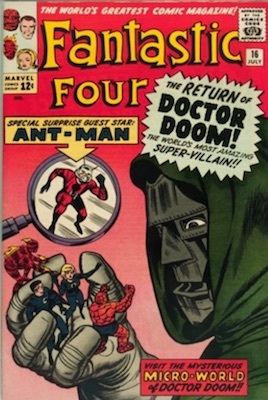 Doctor Doom shrinks the Four down using another Marvel serum! And Henry Pym joins in to lend his pint-size experience. Click here to read our Fantastic Four comic book price guide. 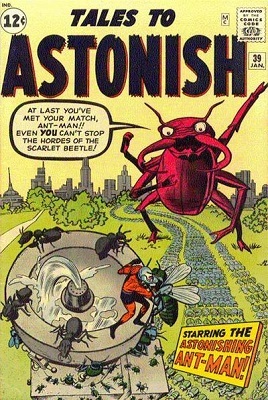 The mighty Ant also appears in several Iron Man comic books. The most important of these are Iron Man #44 and Iron Man #125. 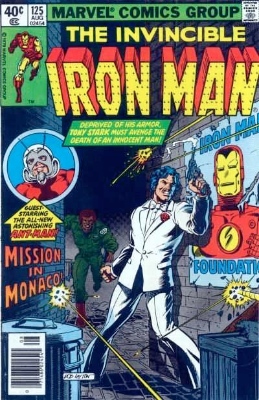 You can read our Iron Man comic book price guide here. 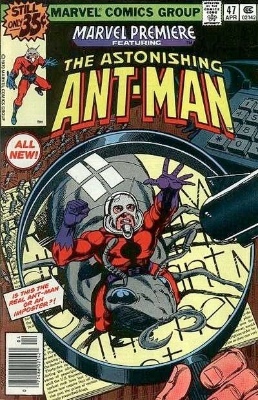 The new Ant hero, played by alter-ego Scott Lang, kicks off in the 1970s comic Marvel Premiere #47. His origin is also outlined there. 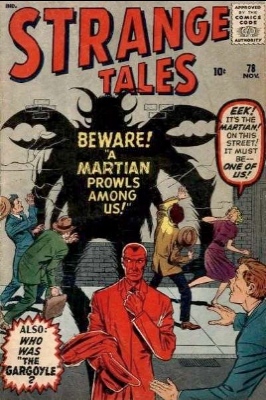 Another 1960s appearance, this time as a reprint, was Marvel Tales #3. If you come across one of these in top shape, it's not a bad find, though nowhere near as exciting as the original story would be! Click for value. 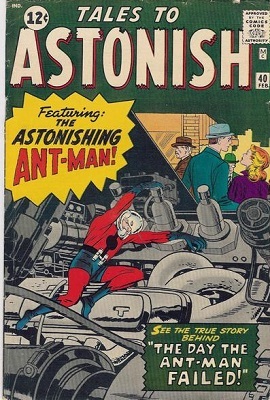 "I loved Ant-Man, but the stories were never really successful. In order for the character to be successful, he had to be drawn this small next to big things and you would be getting pictures that were visually interesting. "The artists who drew him, no matter how much I kept reminding them, they kept forgetting that fact. They would draw him standing on a tabletop and they would draw a heroic-looking guy. "I would say, 'Draw a matchbook cover next to him, so we see the difference in size.' But they kept forgetting. So when you would look at the panels, you thought you were looking at a normal guy wearing an underwear costume like all of them. It didn't have the interest." Despite not getting his own Silver Age comic, Henry Pym eventually joined up with various sets of The Avengers, sometimes being referred to as Giant-Man. 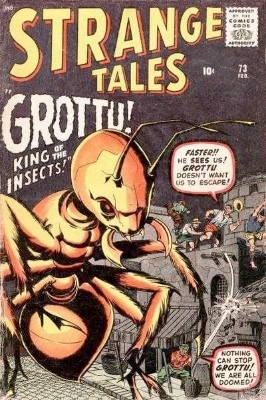 There were three prototype-style stories featuring ant-like creatures, all in Strange Tales. Have Your Comics Valued Today for Free! 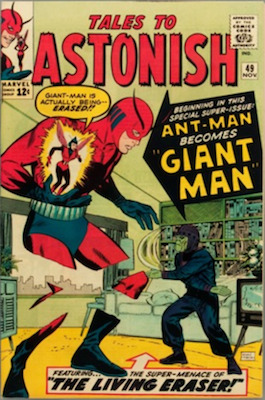 If you have Ant-Man or Tales to Astonish comics from the 1960s, we would love to help you sell, value, or find insurance for these national treasures. 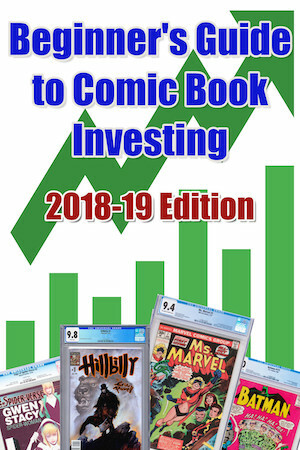 Learn the value of different Marvel superhero comic books, including The Avengers, Hulk, Captain America and Iron Man. Have yours valued too! Learn the value of the key Avengers issues, including the early run featuring Wasp and Ant-Man. 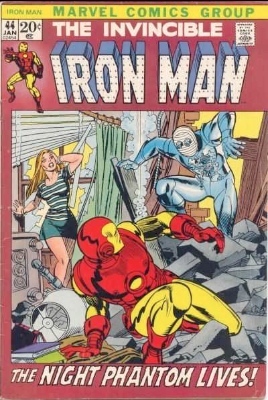 As well as appearing in the Avengers super-team, Iron Man had many other comic books. Find out the value of the early and key issues. Read about the values of TTA issues. We list all 101!